Mary Gould 1827-1897, the mother of Nat Gould, entered the birthdays of members of her family and those of friends in a beautiful printed book, lithographed in colour with vignettes of flowers and fruit, country scenes or seascapes on each page, accompanied by a Biblical text. It provides information which would otherwise be unknown or at least hard to discover, as church baptism registers rarely give birth dates. Mostly only the days and months of birth are given, but the birth years are available from other sources. 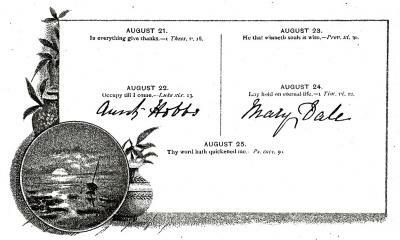 Mary Gould began making entries from 1887, with additions until shortly before she died in 1897. The book was then passed to Nat Gould, his son Sidney Nathaniel Gould, and then to his daughter Stella Alice Clay who made a few additions of her own (1). 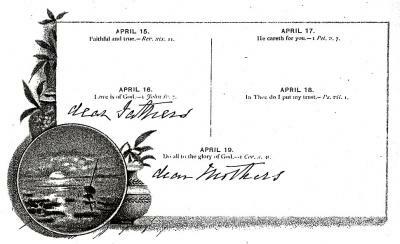 The page recording the birthday of her late husband Nathaniel Gould 1824-1874 is shown on the left. 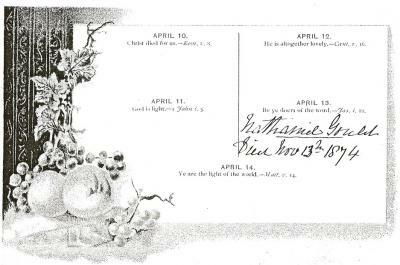 On the right is the record of the birthdays of her father William Wright 1796-1882 and mother nee Elizabeth Gould 1802-1843. 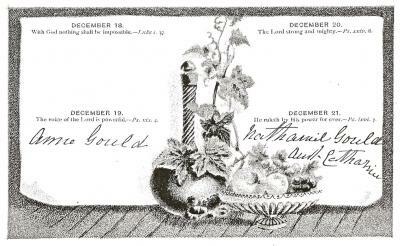 The birthday of her son Nat Gould 21 December is shown on the left. Aunt Catherine was Catherine Gould 1809-1910. She and Anne Gould 1806-1885 were sisters of Mary Gould's mother nee Elizabeth Gould 1802-1843. On the right the 1 March date for her granddaughter Edith Mary Gould is incorrect. She was the first child of Nat Gould and his wife, and was born on 28 November 1886 in Brisbane, Australia. Ellen Gould nee Ellen Wright 1834-1904 was the sister of Mary Gould. She married Gilbert Gould 1821-1891 of Pilsbury Grange. Frank Wright 1869-1954 was Mary Gould's nephew, the son of her brother William Wright 1826-1904. Aunt Hobbs (left) was Elizabeth Wright 1799-1876, sister of her father William Wright 1796-1882. She married William Hobbs 1791-1863. Mary Dale 1852-1869 was the daughter of Mary Gould's sister nee Ann Wright 1824-1910 who married Thomas Dale 1821-1890. Mary Lock (right) was the companion of Aunt Hobbs and niece of her husband William Hobbs 1791-1863. 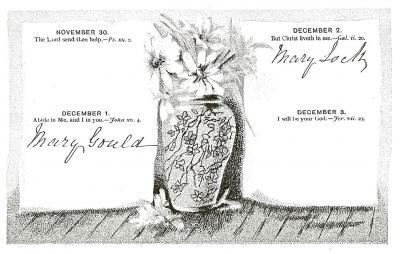 Mary Gould added her own birthday 1 December. Two entries by Stella Alice Clay, great-granddaughter of Mary Gould, daughter of Sidney Nathaniel Gould. "Mother - Alice Gould" (left) was nee Alice Ethel Butler, the wife of Sidney Nathaniel Gould. (Right) the identity of "Miss Rowe" is unknown. Also left, Sarah Wright was Sarah Anne Redfern 1834-1904 who was married to Mary Gould's brother William Wright 1826-1904. Sarah Grove was Mary Gould's sister nee Sarah Wright. She was married to Frederic Dormer Grove. 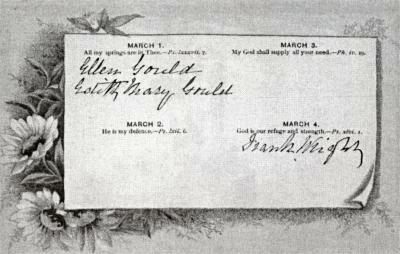 Also right, Willie P. Gould was William Pichott Gould 1855-1857, the firstborn son of Mary Gould who died in infancy. Her other son who died when a baby, Henry Gilbert Gould 1859-1860, has his birthday entered on 9 September. 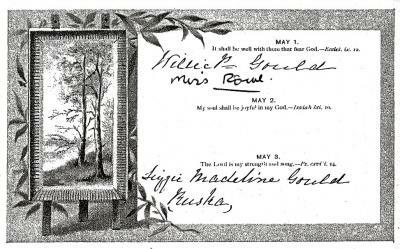 The 3 May entry for Elizabeth Madeline Gould nee Ruska uniquely reveals that she was known in the family as "Lizzie". The book bears the printed monogram EJH on its back cover, and was probably published by E.J. Hey & Co. of London. (1) The book is now in the possession of Mary Gould's great-great-granddaughter Sue de Groot, who has kindly provided the illustrations and given permission for their inclusion. (2) Sarah Parramore was born Sarah Hall on 27 June 1837 and was married to William Thomas Parramore 1840-1913 of Throwley Old Hall, near Ilam in Staffordshire. He was a distant relative of Mary Jane Smith 1845-1883, the first wife of Frank Wright 1842-1913, brother of Mary Gould. The Parramore family had emigrated to Australia in 1877. 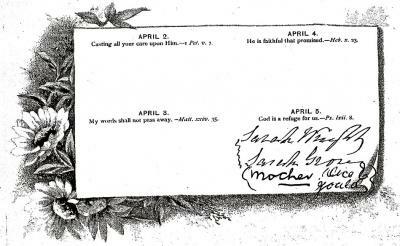 Mary Gould entered the birthday of Sarah Parramore on 27 February, but that appears to be incorrect. (3) Actually 16 July 1869, according to the inscription on his gravestone.